American Idol Season 3 Winner! She may have won with her version of American Idol’s 2004 single “I Believe,” but it was her passionate take on George Gershwin’s “Summertime” that had everyone talking weeks after she had performed. That she delivers teen pop and classics from the American songbook with equal conviction is a testament to the versatility of singer Fantasia Barrino. 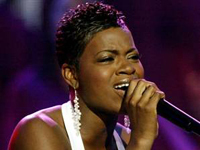 Confident to the degree you could consider her brash, Barrino seemed an unlikely candidate to take the teen-oriented show’s title at first glance, but with her dynamic gospel-tinged voice that never failed her, she not only became the Idol judges’ obvious favorite, but the American public’s, too. Born and raised in High Point, North Carolina, Barrino fell in love with music through the recordings of Monica, Brandy, Aretha Franklin, Pink, and — in keeping with her diversity — Aerosmith. Being a 19-year-old single mother and an Idol finalist had some of the media mumbling and sneering, but the always-certain Barrino paid no mind. Becoming a mother at the age of 17 had focused Barrino and given her the strength and drive to audition for the show in Atlanta. Numerous appearances on talk shows and a cameo on the television show American Dreams — playing the role of her beloved Aretha Franklin — followed. Barrino made history when she became the first artist in history to debut at number one with her first single, “I Believe” — written by Idol alum Tamyra Gray.